Some of Vangelis's music leaves me cold. I'd never heard this before and i like it a lot! I know the Cosmos soundtrack album is doing the blog rounds, I found it a few months ago but I will be fascinated to hear this as I think Vangelis really was at his peak around this time...Spiral is another total classic that I see you have posted..also Blade Runner is just around the corner chronologically speaking! 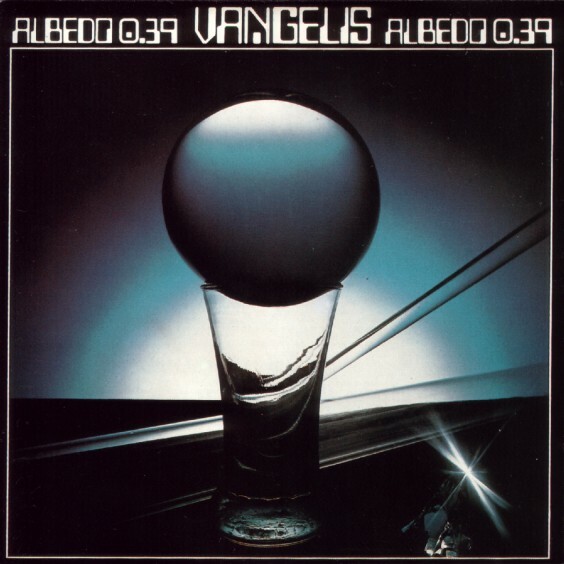 Listening to Vangelis is like reading a classic book in the sense that each time you delve into it again, deeper levels are revealed, the guy was/is a freakin' genius....Earth is another of my favourite albums, though a little earlier than the ones i mentioned, circa 73/74 if memory serves. I've been meaning to listen Vangelis for awhile now. I always see his records in crates and have been intrigued. Thanks for breaking down his periods throughout the articles too. I found that interesting and well written. Heard it in late 70's, and almost looked for up today. It brings many good memories... The gloomy vocal speaking "Albido... zero point three nine"... A BOTTLE OF ICE COLD BEER... And flight is about to start... Thanks a lot. Really, really a LOT!!!!!! I've always been a fan of head music, and I still listen frequently to the old-school electronic prog-rock stylings of Jarre, Synergy, and Tangerine Dream. But Albedo 0.39 was the album that got me interested in the genre. One of my favorites, especially the title cut.